#7....."FALL GIRL" - BODIE 3.7 . you'll never walk alone ! I love the tension of this moment, in Fall Girl and you've captured it perfectly. Thank you! yes the dramatic final scene were the partnership looks lost . I'm glad you can feel the drama coming through and thankyou so much for looking . I think this is the clearest version of this bit from Fall Girl that I've ever seen. On the old discs it was always so murky but here you can see the anger and tension between the two of them. Excellent, as always! Thank you. thankyou so much and thanks for letting me know how clearly this comes across .This is such a dramatic scene that really has no use for words , it's all there to see with the look between them . this is such a dramatic scene and i'm glad you are getting to view it much more clearly . The anger and the sense of broken partnership is very much in evidence here and so much is being said without the need for words . Thankyou . Love this scene between B and D. Bodie's so angry and Doyle's just standing in front of him, no defence offered, because he knows there's no other way to deal with Bodie under such circumstances except head-on. It's a testament to Bodie's self-control (and knowledge of his partner) that he only shoves the gun at Ray. yes me too . 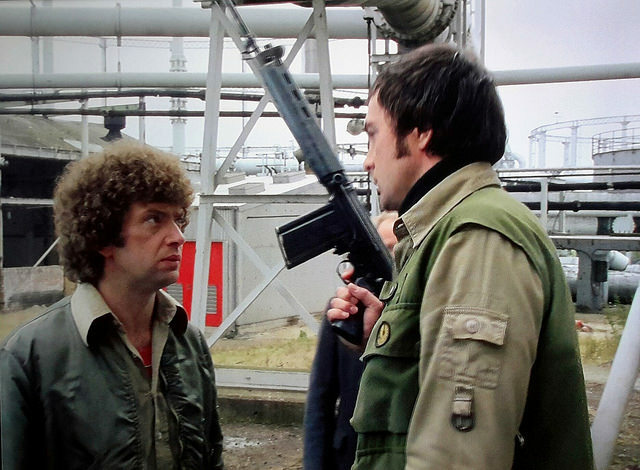 There is so much being said in the look between them and yes i agree it's very much to Bodie's initial control that he only pushes the rifle into Doyle's chest and walks away , it could have turned into something which could not have been mended . Thankyou .